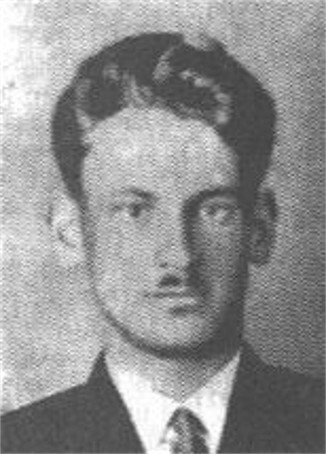 Kravtsiv, Bohdan [Кравців, Богдан; Kravciv], b 5 May 1904 in Lopianka, Dolyna county, Galicia, d 21 November 1975 in Rutherford, New Jersey. (Photo: Bohdan Kravtsiv.) Poet, journalist, and community and political figure; full member of the Shevchenko Scientific Society. A member of the Ukrainian Military Organization and a student activist, he headed the Union of Ukrainian Nationalist Youth (1928–9). In the 1930s he edited several nationalist periodicals in Galicia—Visti (Lviv), Holos natsiï, and Holos—as well as the literary journals Dazhboh and Obriï. From 1940 to 1945 he edited the daily Holos in Berlin and other publications for Ukrainians working in Germany, such as Visti (Berlin). In 1949 he immigrated to the United States, where he worked on the editorial boards of the newspapers Ameryka (Philadelphia) and Svoboda (from 1955). He served several times as the editor of the Plast Ukrainian Youth Association's journal Molode zhyttia and was a member of the editorial boards of the journal Suchasnist' and Entsyklopediia ukraïnoznavstva (Encyclopedia of Ukraine). Kravtsiv's poetry was published in periodicals (beginning in 1922) and in the collections Doroha (The Road, 1929), Promeni (Rays, 1930), Sonety i strofy (Sonnets and Strophes, 1933), Ostannia osin' (The Last Autumn, 1940), Pid chuzhymy zoriamy (Under Foreign Stars, 1941), Korabli (Ships, 1948), Zymozelen' (Wintergreen, 1951), Dzvenyslava (1962), and Hlosarii (Glossary, 1974). From the 1930s on, his poetic style evolved towards a classicist form. He translated into Ukrainian ‘The Song of Songs’ (1934) and Rainer Maria Rilke's poems, under the title Rechi i obrazy (Things and Images, 1947). He edited several key anthologies of poetry: Obirvani struny (Broken Strings, 1955), Poety chumats'koho shliakhu (Poets of the Milky Way, 1962), and Shistdesiat' poetiv shistdesiatykh rokiv (Sixty Poets of the Sixties, 1966). He also authored studies of contemporary Ukrainian literature, such as Na bahrianomu koni revoliutsiï (On the Crimson Horse of the Revolution, 1960), as well as bibliographic guides and articles on old maps of Ukraine and old Ukrainian mythology. His collected works appeared posthumously in three volumes; the first two volumes Zibrani tvory (1978, 1980) were published in New York; the third volume (consisting of publicist essays) appeared in Kyiv in 1995.